Figure 4-8. 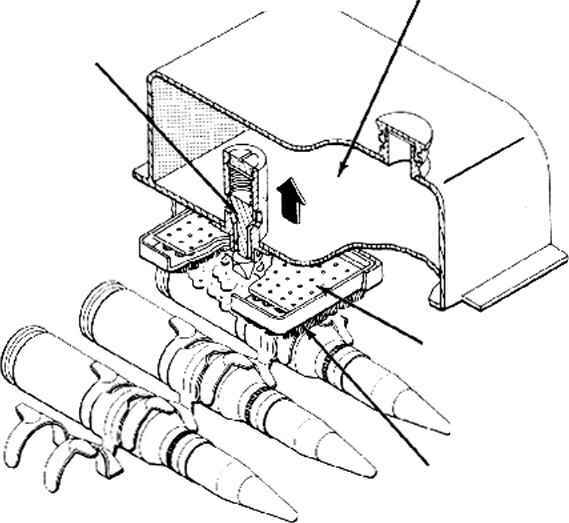 Method of Sealing With Neck of Cartridge Case (With "Buried" Projectile Ammunition). is entirely sealed off from the seam. Tn spite of the fact that the cartridge case material is quite thin at the neck, there is no tendency for the ease to be blown out at the seam, providing of course that the gap is not excessively large. The permissible width of the gap depends entirely on the thickness of the material at the neck of the case. For the thickness found in typical 20-mm cartridge cases, experience has shown that a gap nf over V32 inch can be tolerated without failures. In a well-constructed weapon there should be no trouble experienced in keeping the final width of the gap well below this figure and consequently there will be little danger of case blowouts.